Meta Devices are effects that modulate or control other device parameters instead of manipulating audio. They can even be linked between different tracks/FX Chains, making for complex and powerful routing possibilities. Common usages for Meta Devices are applying modulations with the *LFO device or *Signal Follower, controlling plugin instrument automation via the *Instrument Automation device, or sending MIDI to plugins using the *Instrument MIDI Control device. There are also devices which can use various real-time inputs (notes, velocity, audio output etc.) to guide their behaviour, such as the *Key-Tracker or *Velocity Tracker. Finally, there are devices which can also be used to route and control other meta or audio effect parameters via the *XY Pad and *Hydra. Track Effects: These devices can be used to automate instrument macros or MIDI and plugin instruments. Unlike other sequencers, instruments in Renoise can be played on any track and with these devices you can also control their automation from any track, including ones that the instrument is not playing on. Sample FX: These devices are unavailable. Instead of working through MIDI, the Instrument Automation device sends parameter changes to the Plugin component of an Instrument directly. The device automatically populates itself with the selected Plugin's changeable parameters. Since every Plugin is different, the number and function of those parameters can vary wildly. You may find it useful to watch our short video. Instrument: The targeted instrument, chosen from those available in the Instrument Selector. If the instrument has no Plugin component the parameters below will be blank. Parameters: Shows the selected parameter. Left-clicking will open a drop down menu listing of all the Plugin's available parameters, allowing you to select and use the one you need. Show/Hide Parameters: The small arrow buttons in the bottom-right corner allow you to expand/shrink the device to show/hide parameters. The Instrument Macro device provides simple macro controls for altering the assigned modulation or FX parameters of a linked instrument. The instrument's phrase can also be changed with the menu at the top right. The MIDI Control device broadcasts MIDI pitch bend, channel pressure, control change and program change commands to instruments. By default, up to four parameters can be freely configured per device. If you need more than this, then you can extend the number of parameters up to a total of thirty five by clicking on the small arrow in the lower-right corner. "Custom Name" for CC: Allows you to name your control change parameters, to specify what the CC number does in your plugin or MIDI instrument. CC numbers can be freely assigned in plugins or MIDI instruments. 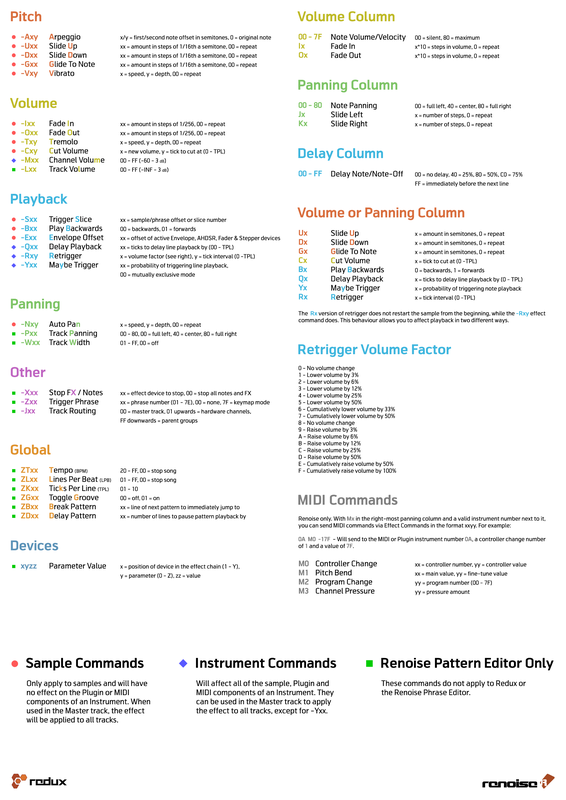 You will find a MIDI implementation chart in your plugin or MIDI synthesizer's reference manual, describing the available parameters. On/Off for PB or CP. A number for CC: Toggles the parameter and specifies the CC number that you want to send. MIDI Message Type: Can be PB (pitch bend), CP (Channel Pressure), CC (controller change) or Prg (program change). Parameter Value: The actual value that is sent or automated. The MIDI channel cannot be configured in this device; it always uses the instrument's channel setting. As soon as a song with a MIDI Control device is loaded, the device will immediately send out all of its enabled parameter messages. Disabling the parameters or setting them to "Off" avoids sending out any messages for parameters you don't want to. 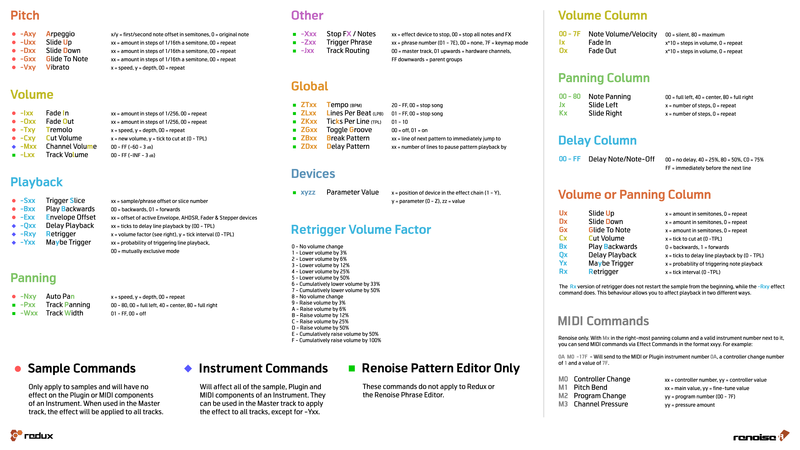 If you want to control a General MIDI instrument quickly (through parameters like volume, panning etc. ), you can do so by selecting the "General MIDI" preset. Mapping Devices can be used to route, cross-link or mix automation from different devices. The Formula device generates an output value from user-created code and up to three input values. Dest. : Destination track/FX Chain, effect and parameter, allowing you to specify the parameter to be modulated. A/B/C Inputs: Inputs to be used in the formula. They can be renamed by double-clicking on them. Close Panel: Clicking the small arrow button will close the panel containing the Code Box and Formula. Help: Brings up a new window showing the available mathematical functions and variables. Code Box: Code for more complex programming functions are written here. Formula: The formula to be calculated using the inputs and any functions called from the Code Box. The Hydra device allows the mapping of its Input value to up to nine different destination parameters, opening up a lot of possibilities for cross-routing and macro automation. Input: The parameter to be mapped to the destination parameters. This value can either be changed by moving the slider in the GUI, by Effect Commands or via Graphical Automation. Dest: The parameter which you want to map to. As soon as a valid connection is made, the Min and Max values will appear and the destination becomes active. To invert a mapping (e.g. control volume from 0 dB to -INF dB, instead of -INF dB to 0 dB), simply swap the Min and Max values. Scaling: The scaling that will be applied from the input to the destination. By default, the input will be mapped linearly, but you can also select from two exponential and two logarithmic scales. Show/Hide Parameters: The two small arrow buttons in the bottom-right corner allow you to expand/shrink the device to show/hide parameters. The XY Pad is a small Hydra device which only maps two destination parameters, but offers a two dimensional XY pad for the automation. With the pad you can easily control two parameters at once. X/Y Axis Setup: Configure the X axis destination parameter or the Y axis destination parameter. Dest & Scaling: See *Hydra device. Auto Reset: Toggles whether releasing the mouse button on the XY pad will cause the device to jump back to the specified values, much like an auto-centring joystick. Show/Hide Parameters: The small arrow button next to the XY pad allows you to show/hide the parameters. Modulation Devices, as the name suggests, modulate other effect parameters. They can be triggered and synced by Effect Commands, Graphical Automation, velocity values and even note values and volume envelopes of audio data. The Key-Tracker device works in much the same way as the Velocity Tracker, except it adjusts a parameter according to note value instead of velocity. Input: The instrument/sample to be used for input. Selecting "All" will affect every instrument played in the current track/FX Chain. Dest. Min: The minimum value to be used from the destination parameter's range. Dest. Max: The maximum value to be used from the destination parameter's range. Range: Minimum and maximum note range that will be used for input. Clamp: Each note within the range will trigger an event, while notes outside of the range will be clamped to the specified limits. Soft: Notes outside of the range are completely ignored and will not trigger anything. Octave: Notes played on different octaves will be handled equally, e.g. a C-5 will have the same effect as a C-4 or C-3. The LFO device allows you to easily create a constantly looping Automation. Any effect parameters can be modulated this way, even those of plugin effects or instruments which cannot normally be modulated within the plugin itself. Amplitude: The maximum range that will be applied to the destination parameter. 100% will modulate the full range. Offset: The modulation offset applied to the destination parameter. Frequency: The speed of the modulation in Lines per Cycle. For example, an LPC of eight will cycle the LFO once every eight pattern lines. Reset: Left-clicking resets the LFO's current phase, while right-clicking (track effects only, not sample fx) will automate the reset during song playback by placing a command in the current track's effect column. LFOs run constantly, even while the song is stopped. In order to sync the LFO's cycle to the song, you have to automate the "Reset" button. See below for more details. Custom allows you to draw a custom waveform. If you set the custom wavelength to match the Frequency value, then one automation grid point becomes equal to one Pattern Editor line. Envelope Type: Dictates how the envelope's value will change over time. Points: Only changes value when a point is encountered. Linear: Interpolates between points in a linear fashion. Curve: Interpolates with a smooth cubic curve, easing into and out of points. Envelope Size: Alters the length of the envelope by changing the amount of points. One Shot: When enabled, the envelope will run only once until a "Reset" command is given. Ext. Editor: This will open the envelope waveform graphic in the large central section of the interface, allowing for finer control over details. This also gives you additional tools to use, as well as the "Detach" button in the lower right hand corner. When clicked, this will open the envelope in a completely separate window, which can be moved around and resized. Clicking "Attach" will reattach the window to the main interface. Clicking either the top right "X" or "Ext. Editor" button will remove the larger editor. Presets: Right-clicking a button will store the current envelope as a preset. Left clicking will recall a previously stored envelope. 00 restarts the LFO from the beginning. 40 restarts the LFO from a quarter of the way through of the cycle. 80 restarts the LFO from halfway through the cycle. C0 restarts the LFO from three quarters of the way through the cycle. The Meta Mixer accepts input from up to three other Meta Devices and combines them in a customisable way to create its own output value. This final value is then used to automate another device. Min: The minimum value to be used from the destination parameter's range. Max: The maximum value to be used from the destination parameter's range. Scaling: The scaling that will be applied to the final output value. By default, the value will be mapped linearly, but you can also select from two exponential and two logarithmic scales. Input A/B/C: The value coming from the output of the connected device. If no device is connected, then the value may be manually adjusted. Weight A/B/C: The Weight adjusts the ratio of each input and how much influence they have over the final output value. This ratio is represented on the right-hand graph. The Signal Follower device analyses a track/FX Chain's audio via volume tracking, much like compressors do, and then uses it to automate a destination parameter. To set up a side-chaining effect, place the Signal Follower device in the track/FX Chain you would like to use as a carrier and set the destination parameter as the volume of the Pre-mixer or Gainer in another track/FX Chain. Dest. Off: Offsets the destination's min and max values equally by the specified amount. This can be especially useful when you want to automate the modulation. Attack: Attack rate of the volume envelope. Lower values will respond quicker to volume changes in the audio input. Release: Release rate of the volume envelope. Higher values will cause the volume tracking to react more softly when the input's volume drops. - Listen to the filtered input signal only. Gives you a better idea of how the signal will affect the destination parameter. LP Filter: Cutoff frequency of a LowPass Filter applied to the input. Used to restrict the frequency range that will trigger the volume envelope. HP Filter: Cutoff frequency of a HighPass Filter applied to the input. Used to restrict the frequency range that will trigger the volume envelope. L/R/L+R: Select which channel(s) will be used for the input's volume tracking: left (L), right (R) or both (L+R). Lookahead: Shifts the envelope back in time by the specified amount, which can be used for snappier attack rates. Activating this will add some latency to the device, so this option will only work if "Automatic Plugin Delay Compensation" is enabled via the "Options" menu. Unlike the other Meta Devices, the Signal Follower cannot affect devices that appear on track/FX Chains to the left of its own host track/FX Chain. It is also unable to control effects on the same track/FX Chain as itself, if that device appears before it in the effect chain. Such track/FX Chains and effects will show in the "Dest." box with the suffix: "(N/A)" (i.e. Not Available). This is necessary to ensure that the Signal Follower does not add latency to the song's signal chain. If you want to affect a track/FX Chain or device that currently shows as "(N/A)", then simply reorder the tracks or reorder your effects so that the Signal Follower appears before (to the left of) the desired parameter. The Velocity Tracker adds another dimension of control by responding to the velocity values of notes. For example, when modulating a Filter's cutoff value with a Velocity device, the sound of an instrument can then be drastically altered by pressing the keys harder or softer. Range: Minimum and maximum velocity range that will be used for input.